It's back to school time! Did the summer fly by for anyone else?! This is a big year for my son, not only is he going into fourth grade, this is also his last year at the elementary school. I know it will be a great year for him, even though I might be a little emotional, my tears won't slow him down any - he's growing up so fast! I'm so excited to send him on his first big day looking comfortable and cool thanks to Kmart! At Kmart you will find everything you need to get your child, teen or college student ready for school! You will find school supplies, dorm gear, shoes, clothes and so much more - all at an affordable price! 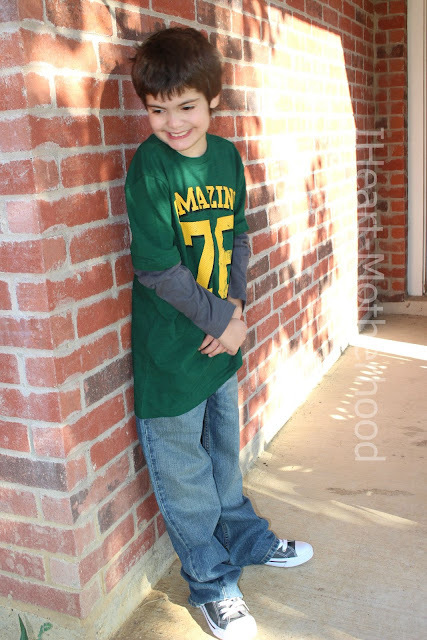 After shopping the back to school collection at Kmart, I picked out the Basic Editions Boy's Graphic T-Shirt - Amazing, Route 66 Boy's Stonewashed Bootcut Jeans and Joe Boxer Boy's Recap Gray/White Causal Sneaker for Big Brother C! I really love the layered look of the Amazing T-Shirt, not to mention it's super soft! The Bootcut Jeans are comfortable, durable and adorable! The Stonewashed finish denim is always a classic go-to look, they even feature an adjustable waistband! Shoes are a big deal in our home, I've actually never purchased a pair of canvas shoes for Big Brother C, but we are both really liking these from Joe Boxer! The fit is perfect, they have that "clean" style and they pair great with almost anything - jeans, shorts, you could dress these up or down! Connect: Be sure to follow Kmart on Facebook and Twitter! Buy it: You can purchase the outfit featured above at Kmart! Aww cute outfit and smile! And I just love those shoes!